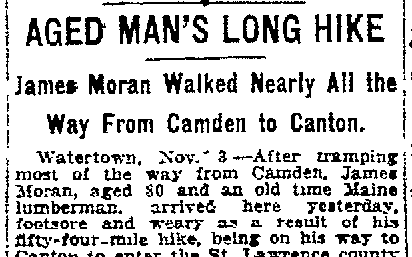 James Moran Walked Nearly All the Way From Camden to Canton. Watertown, Nov. 3 – After tramping most of the way from Camden, James Moran, aged 80 and an old time Maine lumberman arrived here yesterday footsore and weary as a result of his fifty four mile hike, being on his way to Canton to enter the St. Lawrence county home. He said that when he left Rome Tuesday he supposed they had given him a ticket to Canton, but that at Camden he was put off the train that being the destination the ticket called for. The rest of the journey to this city he made on foot with the exception of an occasional lift from some kindly driver. He was sent temporarily to the Jefferson county alms house and will probably be transferred to the St. Lawrence county home. He claims Fine, St. Lawrence county, as his boyhood home, but worked in the Maine lumber woods many years.